A PHONE box has been left in the middle of a busy road after tram works moved the pavement five feet further back. The road has already been resurfaced around the smashed-up BT box, bizarrely leaving it sitting on an island on the road. Furious locals have branded the situation “preposterous” after being told that it will cost £20,000 to remove the monstrosity. Workers on the Edinburgh Tram Link resurfaced the road at Leith Walk but instead of removing the box, they simply laid around it. The road has had to be closed off by barriers, pushing a bus stop into a bus lane and slowing traffic. Transport Initiatives Edinburgh – the company responsible for the works – said they were planning to move the box. But local businessman, George Sandison, said that staff at TIE told him that BT had demanded £20,000 to remove the box, which can make 999 calls only. “First of all it’s smashed up and vandalised, so it’s a real eyesore. “But where it’s sitting – it just looks ridiculous. “There’s a lot of rubbish builds up in the gap between it and the barriers, which have to stay there all the time so people don’t try to park. Mandy Haeburn-Little, director of customer services and communications at Edinburgh Trams, said: “The phone box is scheduled to be removed in the near future. 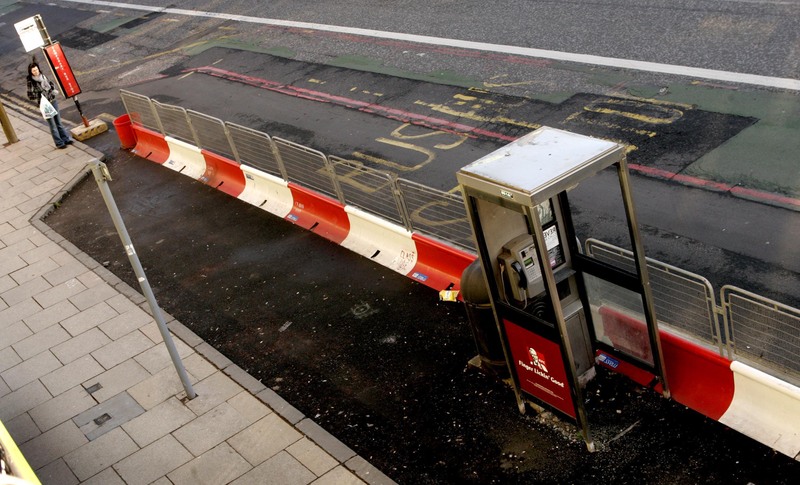 “Due to a number of practical reasons, namely the need for the phone box to be disconnected, the requirement for lifting equipment and the temporary impediment to traffic flow on Leith Walk this has meant that the phone box has not yet been removed. The works – costing £550m were thrown into fresh controversy yesterday when it was revealed the council watchdog set-up to monitor them had met just twice in the last year. And just five official questions have been tabled at the City of Edinburgh Council meetings since it January 2008. As frustrating as the phonebox must be to the locals, the telling of this story had me drop-jawed at the over exaggerated claims by the journolist that composed this piece of garbage. The phone box is in the area laid out to be the bus stop. This can be clearly seen in the photo, yet the author claims dramatically that… “A PHONE box has been left in the middle of a busy road”. No Rory, the unloading and loading bay for a bus is nowhere near the middle of a road. Your picture quite clearly shows it within the area of the drop off. Another dramatic claim made that tickled me was… “The road has had to be closed off by barriers, pushing a bus stop into a bus lane and slowing traffic.” Ummm… how can the traffic be slowed down in a lane that is dedicated to buses? Even if the bus stops, there shouldn’t be any other traffic in there other than other buses! The author of this article really should calm his jets and perhaps compose a piece mocking BT and the phone box rather than make exaggerated claims of delays and danger to road users. Poor journolism at it’s finest. The daily red tops await you, Sir.